Queenstown wedding packages and eloping wedding in New Zealand are easy and save you money. 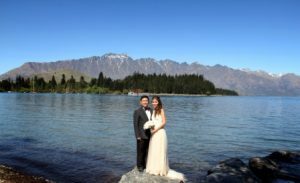 When you chose Eloping Weddings New Zealand to plan your special day you can be sure you will get the every best suppliers Queenstown has to offer. We have packages that are full of the finest professionals and we have done the hard work negotiating to keep the packages inexpensive. We have basic packages that are fully comprehensive and cover all the most important parts of your wedding day. From a legal registered officiant to stunning highlight wedding videos, we only use the best people in the wedding industry. This beautiful area of Queenstown and Wanaka offers a lot of value for the discerning client. With world class wineries and venues, Queenstown will wow even the most distinguished of travellers. Couples wanting to get married in Queenstown deserve the best photographers and videographers the area has to offer. Because this area is beautiful you won’t want to miss a thing. 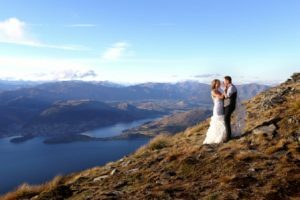 If you want the best and most scenic photos for your New Zealand wedding, Queenstown is the wedding destination for you. Queenstown weddings in New Zealand take advantage of the alpine village that is surrounded by the glacier feed waters of Lake Wakatipu. It also boasts an amazing night life scene and myriad of excellent fine dining restaurants. Countless snow capped peaks that shape this historic village make this a highly sort after area of New Zealand to elope. Blessed with world class restaurants and bars, it’s the ultimate holiday destination and almost perfectly designed for creative wedding photography. Imagine getting married on the top of a mountain over looking the stunning Lake Wakatipu and Queenstown city. Snow clad mountains and panoramic vistas that will blow your mind. This package is complete with helicopter flight, two witnesses, help with your marriage licence, photography package and NZ registered marriage celebrant finishing with bubbles to celebrate. This cute little package is very popular and ideal for travelling couples wanting to elope in New Zealand. This stunning area boasts an international airport for your convenience and it is only a few hours drive to Wanaka and Tekapo. Both are highly sort after wedding destinations and offer the very best in accommodation and top rating restaurants. Eloping Weddings New Zealand arrange complete Queenstown wedding packages and save you money along the way. When you choose us to plan your day we have options to arrange your full New Zealand holiday itinerary and pre-book all your activities, accommodation and adventures. 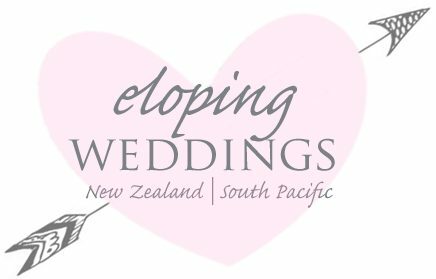 Eloping Weddings Limited are a legitimate NZ registered company. We have contracts with many hotels, helicopter and adventure companies to book everything you will need for an awesome, fun filled, New Zealand eloping vacation. To ensure your wedding day and itinerary and is perfect, we plan everything well and truly before you even leave home. Our packages are complete, you won’t need to do a thing. All the luxuries like 5 star + accommodation, high end golf courses, scenic flights, heli-tours and scenic cruises to complete your New Zealand holiday are available when you book your wedding with us. With year round opportunities that offer a variety of backdrops to frame your wedding photos. Queenstown has it all. From snow capped peaks in winter, golden colours during Autumn and the deep blues of summer and spring, Queenstown will inspire even the most discerning bride! Contact us for an information pack complete with prices on all our weddings throughout New Zealand. We have a variety of options to contact us for your convenience that can include all your activities and adventures.